Pause working in the business. Free the mind, and work on your business. Make your reunion an experience to remember, free from distractions, free to simply enjoy God’s creation and each other. A little off the beaten path, but so are you. Create the unique wedding you always dreamed of. Exotic and Whitetail. 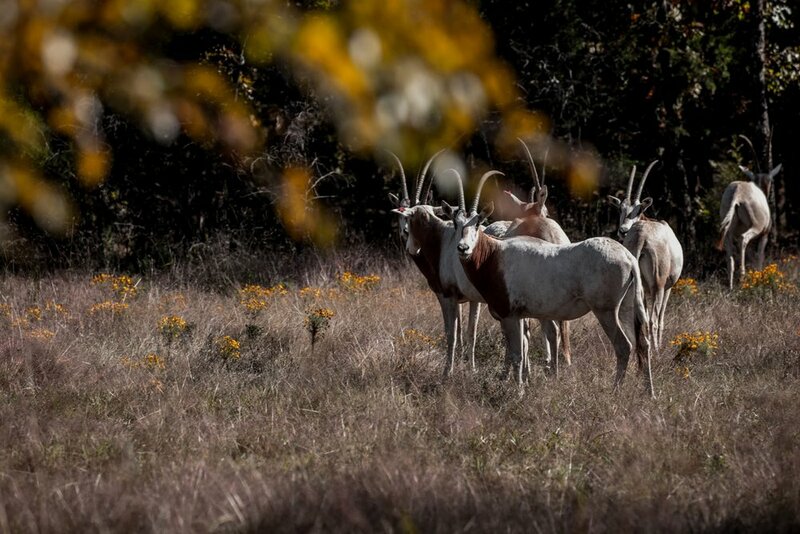 Hunt when you want, without seasonal limitations, exclusively at Pogue Ranch. Serenity now…it is possible to experience. Experience unforgettable serenity on your next get-away with your spouse or family. We live in a noisy world. Smartphones, meetings, traffic, kids’ sporting events…the list goes on. And while life “on the grid” is often good, sometimes it turns into a grind. How do we mute the noise, if only for a time? Just long enough to share in celebration with loved ones, reflect and plan with your team, or just retreat to a place where we can think and be free? 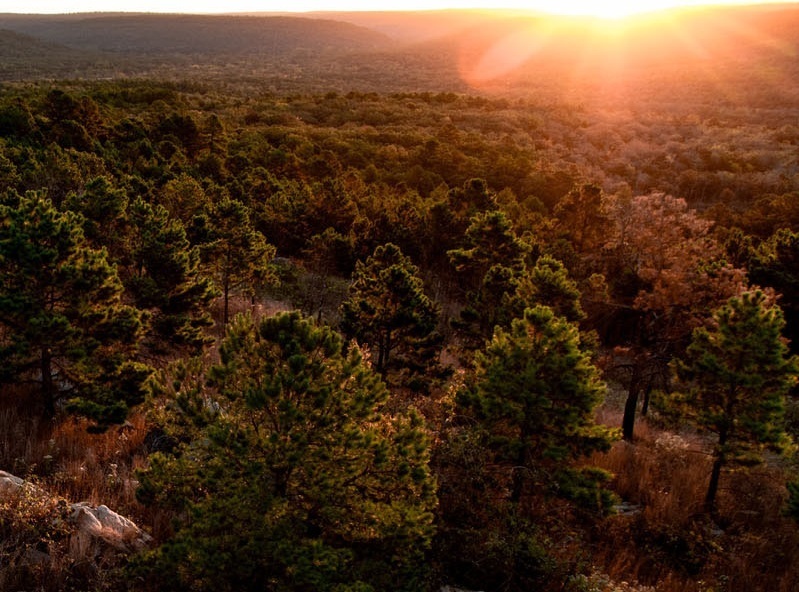 Experience the tranquility, peace and adventure unique to Pogue Ranch, tucked within the breathtaking Ouachita Mountains of Southeastern Oklahoma. Team retreat, family reunion, wedding, hunting, or weekend getaway…scroll on to learn more! Your team is deep in the hustle of performing…working in the business. But what about working on the business? Because we’re often consumed by our environment, it’s tough to do both, well. Think about it for a moment. Our environments are so noisy…noisy with the constant hum of life in the business. And while life is often good, if we don’t prioritize working on the business, working in it becomes an incessant grind. Someone once said, “Family is like branches on a tree; we all grow in different directions, yet our roots remain as one.” If you’re exploring places to bring your branches all back together again, you’re in the right place! At Pogue Ranch, your family can come together free from the distractions of “the grid”. Experience the great outdoors in the Ouachita Mountains of Southeastern Oklahoma, while enjoying the comforts of your five star accommodations. To learn more about your experience packages, click here. 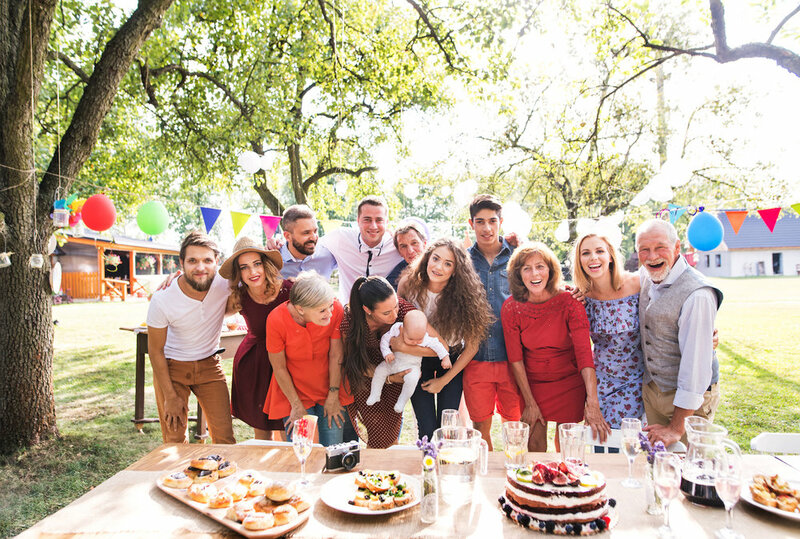 Just getting started with your family reunion and would value a planning guide? Get your guide here. Hunt when you want without seasonal limitations. From exotics including Axis, Fallow Buck, Gemsbok, and Skimitar Oryx, to native Whitetail, Ram, Stag, and Turkey…choose the hunt you want when you want. High fence or free range, hunt on foot or from one of 18 well-placed stands. For your stay, enjoy five star ranch accommodations and some of the best home-cooked food you’ll ever eat. Learn more here. Looking to host a group or multiple groups for your hunt? Check out this quick-read guide with 10 tips for a successful group hunt to create an unforgettable hunt experience. “But from the beginning of creation, God made them male and female. Therefore a man shall leave his father and mother and hold fast to his wife, and the two shall become one flesh. So they are no longer two but one flesh.” - Jesus in Mark 10.6-8. Choose from multiple breathtaking sites to share your vows and celebrate with friends and family. Create a wedding experience where the ceremony and activities you choose to compliment it are uniquely unforgettable. Not sure how your wedding would look at Pogue Ranch? Get a guide with insights here. Get off “the grid” for a few days and get into the serenity of your Pogue Ranch experience. From five star accommodations in the Main Lodge, or the seclusion of a cabin by the lake, enjoy both peace and adventure in your stay. Take a horseback ride or a carriage ride. Enjoy a walk lakeside, go fishing, or hike the mountainside. Even take a guided tour of the ranch and see the exotic wildlife including animals from Europe and Africa. Ready to book? Click here. Want to learn more about activities on the ranch? Click here. Seasoned rider or first-timer, enjoy the sites and sound of the ranch the way the original settlers and inhabitants of the region experienced it. There’s no better way to enjoy an evening in the country than around a roaring campfire. Roast marshmallows and wienies, or just sit and talk a spell. It’s good for the soul! Can you believe people crossed the entire country in these? Get a taste of history and learn more about the land with one of the most unique experiences at the ranch. You won’t believe your eyes! No light pollution for miles and miles means you will get to see one of the best shows on earth. Sit quietly and contemplate just how awesome our universe is. The well-stocked Memorial Lake is waiting for you. Fish from the shore or from a boat. It’s a great way to experience the beautiful nature around you. Get a guided tour of the wide range of exotic and domestic animals on the ranch. You won’t believe you’re still in Oklahoma! Experience the beauty of the Ouachita Mountains on your own feet and at your own pace. Unplug for a bit with a solo hike or schedule a group hike with a guide. Motor around Memorial Lake. Feel the wind in your hair, the sun on your face, and the gentle rocking of the waves. 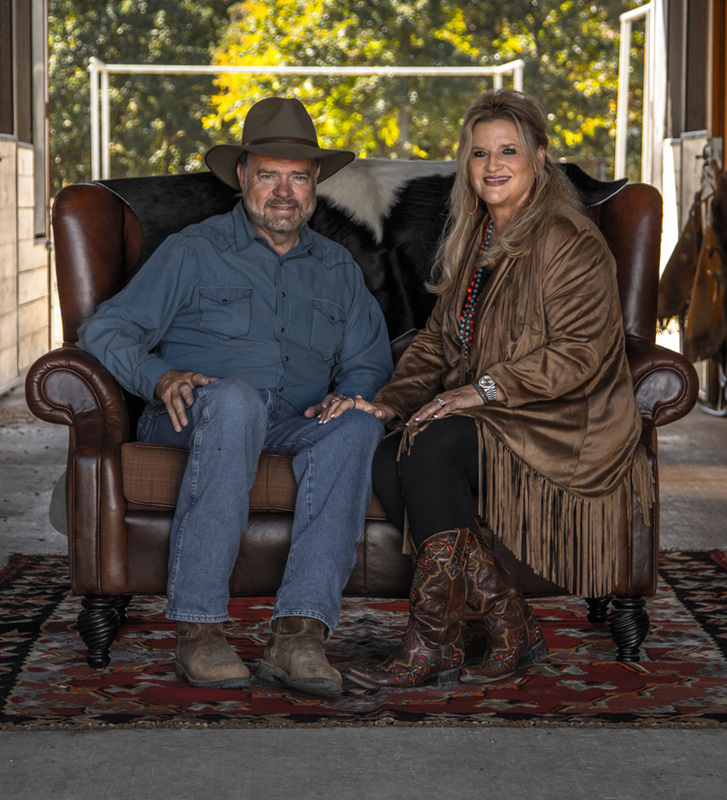 Your Pogue Ranch experience will be all you hope it to be in large part because of experienced destination ranchers, As your guides, Joe and Allie Fairchild have seventy years of combined ranch management experience. They sweat the small stuff, so you don’t have to. Joe is an expert cattle rancher, horse trainer, and Cowboy Preacher. Allie has an MBA with a focus on hospitality and human resource management.